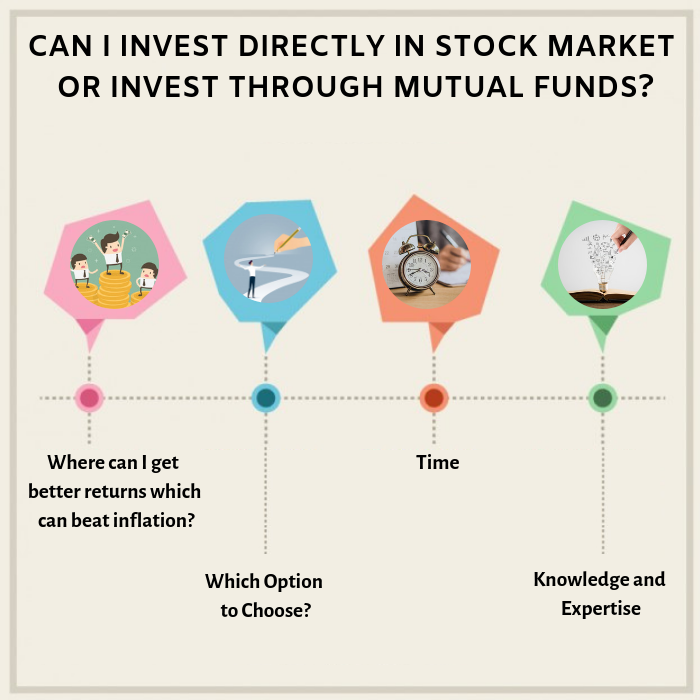 Can I invest directly in stock market or invest through mutual funds? Where do we invest our long term money? Where can I get better returns which can beat inflation? The answer for both the questions is investing in stock market. Once you decide to invest in stock market, you have got two options. The option one is to invest directly in stock market and the option two is to invest through mutual funds. Each of the options has got its own pros and cons. Depending upon your requirement and situation, you need to choose the right option. The following points will enlighten you on both the options and will also help you understand and check the factors to be considered before choosing the right option. If you are comfortable doing all these things, then you have qualified the first criteria to invest directly in stock market. If you are not comfortable doing all these things, then you can opt to invest through mutual funds. There is a fund manager in mutual fund who is an expert in equity investments. He along with his team of analysts will take care of investing in equities. As these fund managers are managing funds of many investors, they have crores of money to invest in equity market. Average size of an equity fund is 1000 to 2000 crores. As they are handling huge money, they do sophisticated research, buy research reports from various economic research bodies, and directly interact with the management team of the company before making investment into a company. It is not possible for an individual investor to do all these things. Are you a time rich person? If you have answered yes, then you can think of investing directly in stock market. For doing stock market analysis & research, market watch, portfolio review, demands a lot of time. Also as a direct stock market investor, you should have access to the market anytime. At times, there may be some sudden news or major stock market movement. Because of that you may need to make some investment decisions immediately. You need to react on time on those occasions. Investing directly in stock market is a time sensitive game. Is it worth your time? During a stock market working day, you need to spend at least 2 hours on the stock market in order to be a successful investor. Instead of spending 2 hours everyday in the stock market, if you spend the same on your own business or profession or career, will you make more money? A doctor may be able to earn more if he spends those 2 hours in his practice in instead of spending it on the stock market. It depends upon how much money you invest and how much return you make in the stock market vis-à-vis how much money you make in your profession. If you are not a time rich investor, then you can choose mutual funds route for stock market investments. Here you will be spending very minimal time, but you will get almost similar returns to direct stock market investments. There are 2 set of investors. One set of investors will invest in the stock market to make money in the stock market. There is another set of investors who will also claim that they are in the market to make money but actually they are in the market because it emotionally engages them. Let me explain. When you are travelling in a car driven by a driver, it will not emotionally engage you. But when you are driving the car, it will emotionally engage you. It will emotionally engage you when you are overtaking another vehicle, when you are driving at 100Km per hour speed… It gives you a kind of thrill when you are self driving. Similarly when you are investing directly, it also gives you a thrill. You will feel happy when the share you have selected has gone up. There will be a sense of achievement when you sold a share at profit. This is what I call it as emotional engagement. Instead of investing to make money over a period of time investors, invest directly for the kick or thrill of emotional engagement. Remember. You need to be rational when it comes to money management. If you are emotional, that will spoil the entire game. Are you emotionally matured? This point is just a continuation of the last point. As this one needs more emphasis, I am giving it as a separate point. Many investors go crazy when the market goes up by 50%. They will invest 100% of their savings in the stock market. They also lose their heart when the market goes down by 50%. They will immediately book loss. Because of emotional immaturity, investors invest more, when they are supposed to book profit. They book loss, when they are supposed to invest more. If you are an emotionally well balanced person and a disciplined investor, then you can go ahead invest directly in stock market. Otherwise mutual funds will be your best choice. The fund managers in mutual funds take very rational decision. They are process driven and emotionally well balanced. Based on the above 4 parameters, you can choose between investing directly in stock market and investing through mutual funds. If you are considering these parameters, you will break the records in the stock market. On the other hand if you are not considering these parameters, you will break yourselves in the stock market.